The movie has a somewhat confused structure. In part, it is chronological--the origins of feminist art is located in the 1960s. The film is clear on placing this art within the social movements of the 60s and in opposition to the apolitical, contentless art of minimalism. This is something that is key and will come up later in terms of art history. Hershman places her own story within the context of the larger topic, including discussing how she wrote fake reviews of her work under three pseudonyms, got them published, and used them to get her first gallery shows. Her point was that because she was a woman, it was hard for galleries to take her work seriously, so she had to engage in this ruse. Without knowing the specific circumstances and galleries, it's hard to judge how true that is--I mean, any young artist without a gallery, male or female, finds it hard to get a gallery. (Old artists, too!) Nonetheless, her clever tactic worked, but more important, it actually prefigured some of her subsequent work in which she took on a fictional identity (so well, in fact, that her alter ego had better credit than she did). All this is interesting, but it stops the movie dead whenever she talks about her own art. It's tricky to make a movie that is simultaneously about an art movement and about oneself. The movie moves into the early seventies, when feminist art really took off as a thing. Judy Chicago becomes a major figure, not only for her own art, but also for her founding and cofounding several programs in feminist art. The funny thing about this section is you see that Chicago wasn't good at keeping these programs going--the details are never spelled out, but you get the idea that there were fallings out with her collaborators. That said, lots of interesting artists and thinkers came through Chicago's programs. The movie also discussed A.I.R.--Artists in Residence, a non-profit women's art gallery founded in 1972. Probably the two most famous artists in A.I.R. were Nancy Spero and Ana Mendieta. The way I'm describing the movie makes it seem much more narrative than it is. While there is a general sense of time passing (60s-70s-80s), !Women Art Revolution veers off into discussions of different media that were pioneered by these artists (particularly performance and video) and different subject matters. It touches on controversies (particularly Congress discussing The Dinner Party and later the revocation of certain N.E.A. grants in the 80s), but mostly keeps it focused on the artists and what they were doing. The film portrays the 80s as a period of cultural retrenchment--Reagan, the NEA, and the Guerrilla Girls. But it also makes the point that this was the moment when women art stars came to the fore--Cindy Sherman, Barbara Kruger and Jenny Holzer. The Guerrilla Girls are interviewed at length, and their clever, fact-filled graphics about the percentage of women in galleries and museums is recognized. The film suggests that they had to be anonymous because of the danger to their professions if they became known, and wraps that up into the general sense of 80s reaction. But to me, what we have with the Guerrilla Girls is moving beyond feminists addressing other feminists (for example, consciousness raising) which was very common in the 70s to feminists addressing everybody in the art world, whether they were self-identified as feminist or not. When they pointed out how few female artists there were in the Museum of Modern Art, their intended audience were the curators, directors and trustees of MOMA. And perhaps even more important, future curators, directors and trustees. Because as the movie pointed out, trustees--particularly women trustees--have gradually pushed for more women in permanent collections. The battle between feminist art and minimalism reaches a gruesome apotheosis in 1985. Ana Mendieta, whose work dealt with identity, gender, and the body--obviously important fields for feminist art--was married to one of the key minimalist artists, Carl Andre. Mendieta fell from a 34th floor window on September 8, after an argument with Andre. Andre said he was not in the room when she fell. Andre was tried for murder, and many artists contributed to his legal defense (the film specifies male artists, but I don't know if his supporters were exclusively male). This outraged women artists, and they picketed the trial. Andre was acquitted, which increased their outrage. The film concludes with the success (one might say triumph) of feminist art, including its institutionalization. 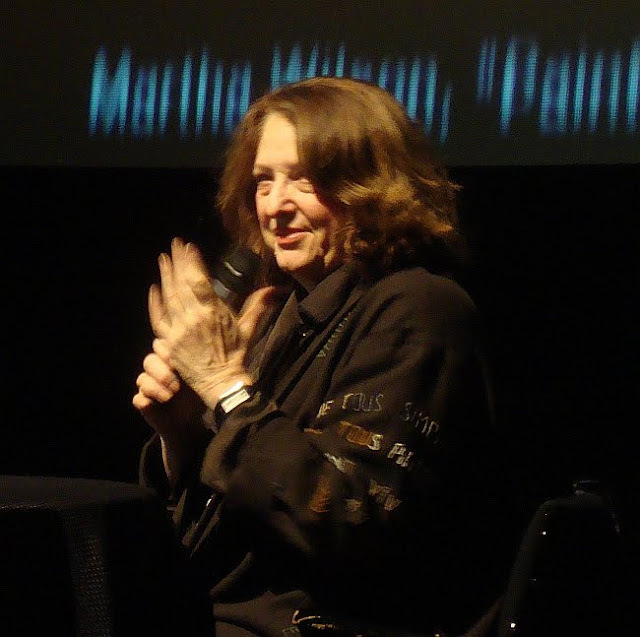 Hershman discusses how her own work is now in the collection of MOMA and the Tate, and that she was able to finance this film. She interviews younger feminist artists who have received MacArthur grants. She discusses WACK!, the huge survey of feminist art at the Museum of Contemporary Art in Los Angeles. And perhaps the most amusing parts of the film were excerpts of an interview with Marcia Tucker, the first female curator at the Whitney Museum who later founded the New Museum. Tucker proved that a feminist could create a lasting art institution. But the most powerful statement--and the most revisionist--was by Martha Rosler. She stated that feminism was the most important art movement in recent history, and pointed out that art historians and critics still tried to split all these artists up into an art history based on style (minimalism, post-minimalism, conceptualism, neo-expressionism, whatever) or medium (performance, video, etc. ), when the most logical grouping was by ideology (feminism). This rings really true--they way you read about these artists is as members of different movements as opposed to all being part of the same movement, the feminist art movement. I've read most of the WACK! catalog, and now I've seen this film. What I would really like to read would be a good narrative history of feminist art. Who did what when, written in a down-to-earth warts-and-all style. (I hate to admit it, but I'd like to know how Judy Chicago managed to piss off so many of her colleagues in the early 70s, for example.) But that's just me--the art world tends to prefer more high-level art histories, as well as more theoretical texts. Story-telling and reportage are frowned upon for some reason. Although it's not without faults, I recommend !Women Art Revolution highly. It will be showing again in Houston in February, 2112, at the MFAH.